Karadi tales has come out with Karadi Chitra, hard bound english story books for the three+ and five+ year old children. We were lucky to get the whole set as gift. We read all the books of which two are clear winners. My four year old loved this book. Ever since I read the title and the blurb, I was intrigued too. Shobha Viswanath starts the story with the earth losing all its shapes. Can you imagine a world with out triangles, straight lines, squares or circles? An adult mind races with images of buildings, architecture, art etc that are possible because of shapes. But a pre-operational child’s mind to which shape is a very 2-d, strictly theoretical concept, knows not of any of the complications. Now a good story teller makes the audience relate and this exactly what Shobha Vishwanath does. Subsequent pages show in illustration and text what a shapeless earth would look like. The eggs are not oval but are already scrambled, oranges are not semi-spheres, but look squeezed, the kite looks windswept and the stick looks beaten. These are little, day to day things that make the children think about the importance of shapes in every day life. At this point in comes the hero - Little Dot, which is literally a dot, which some how holds on to its shape. The rest of the story is how Little Dot saves the world from the shapeless confusion. The story does not go in to detail how the shapes were lost. I was half expecting an onslaught of questions about the how part. But there were none. The author quickly gets in to the practical difficulties of living in a shapeless world and the children were engrossed. Christine Kastl’s brilliant acrylic pallette knife illustrations in bright colors bring fleeting images of Eric Carle to my mind. Definitely a book Karadi can be proud of. This is our very first Anushka Ravishankar book and I regret for having waited so long to lay my hands on one of her books. Like in CitiCard ads: Silly verse - check, funny story - check, nonsense names - check, non-preachy and fun just for the sake of having fun - check, engaging - check, perfect for story telling - check, vibrant illustrations - check, simple enough to read and follow - check, the experience - priceless. My five year old enjoys this book a great deal. Christine Kastl illustration of the cover is just amazing. Seems like a wonderful set of books. 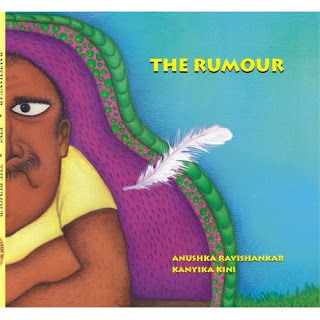 As I had said earlier, 'The Rumour' sounds very Seussian, and seems like a must-buy. Will look out for all of them. btw today i saw a karadi tales jigsaw puzzle at a cousin's place - was quite surprised as i didn't know they existed. Satish: Acrylic/oil using palette knife. Sandhya: Do look for it. Chox: I am not aware of the jigsaws either. 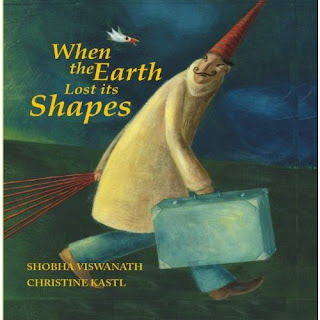 Love the idea behind the books, utbtkids, especially the world without shapes - have to spring these on the kids and see if there are any questions. Sheela, Shapes book is great hit at home. Chox, glad that you enjoyed the book. I saw it in the library. The name Julia Donaldson sparked my interest. But another child was holding it. So I will check it out later. Got both books this week. A loved them. When the earth lost its shapes: Related immediately to the last bit which says that if you look closely, everthing is made up of dots- A has learnt this lately when her father answered some questions she had about resolution of an image. The rumor: A loved it, of course, and she, too, immediately linked it to Dr. Seuss' style. I also loved the fact that the author has brought out the flavour of colloquial language in villages, esp. Maharashtrian villages, of which I have experienced quite a bit. In fact, the text is very easily translatable into Marathi without sounding stilted. Took me back to my roots!